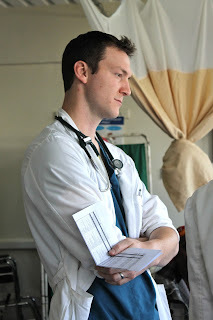 Ever since we moved to Kenya we had every intention of writing a blog post describing what Eli does at the hospital. Well, we're nearing the end of our first term on the mission field and that has not happened. Sitting down to write a blog post never seems to reach the top of Eli's list of priorities. But he still wants people to know what he's actually done these past two years, ranging from rounding on the wards to teaching residents to attending meetings of every stripe. So, in an effort to reflect on these past two years of working at Tenwek Hospital while trying to relay what his job involves without expecting Eli to sit down and write a blog post himself, we've decided to do a Q & A instead. After waking up with our boys and getting them breakfast, I head up to the hospital and do rounds in the ICUs from 7am-8am. Then, from 8am-9am every day, the whole hospital collects either for teaching time or for devotions. After that I continue rounding on the patients in the wards until about 1pm or 2pm. Sometimes rounds get interrupted by consultations or meetings. Or crashing patients. At some point I head home for lunch and see Krista and the boys for a bit. After lunch I head back to the hospital to do a variety of things, depending on the day: finish rounding, help ICU patients who are not doing well, consultations, attend meetings (Transfusion Committee, any of several HIV meetings, Quality Control Committees) and making sure everything is set for the overnight shift. Once done, if there's still time, I'll check my emails. Then I go home for supper. Describe your work with the residents. I get to work closely with each of Tenwek's Family Medicine residents. During their first year they each rotate through my service (which is either Internal Medicine or Pediatrics, depending on the month). Our senior residents I get to work with primarily during their Critical Care rotation as well as helping them with their research for their Masters thesis. I also host Tenwek's weekly teaching session with all the residents. We cover things like difficult-to-understand medical topics, ethics cases, and review their educational prescriptions (weekly assignments to write about what they've been learning). We also do a Bible Study during that time. All of this is in addition to general mentoring and helping with life details (i.e. arranging logistics and housing for a rotation at a different hospital) for both our residents and interns. What are some medical conditions that you commonly see here that you did not see in America? HIV and HIV-related illnesses, tuberculosis, rheumatic heart disease and pesticide ingestion as a form of suicide are all extremely common. Other things that I didn't see much of in the US but that we have plenty of here are: Guillain-Barré syndrome, malnutrition, malaria, tetanus, cholera, typhoid and numerous other forms of infectious diseases. How big is Tenwek Hospital, and what services are offered? Tenwek is a 300-bed hospital and serves as a referral center for the region. It handles difficult cases in Internal Medicine, Pediatrics, OB/Gyn and General Surgery. It is also well-known for its specialty surgical services such as cardiothoracic surgery, neurosurgery and urogynecolgy. Tenwek is particularly well-known for heart surgery, as an estimated 2/3 of open-heart surgeries done in sub-Saharan Africa outside of South Africa are done at Tenwek. Along with all of these difficult patients comes the need to be able to care for them medically, hence Tenwek's two intensive care units. We regularly receive referrals from other hospitals for ICU care alone. Tenwek is also known for its endoscopy department. This is largely due to the fact that the Rift Valley region which has one of the highest rates of esophageal and stomach cancer in the world. Tenwek has not only been diagnosing and treating these cancers for a long time, but has also been producing a steady stream of research on the topic. How do you communicate with patients? 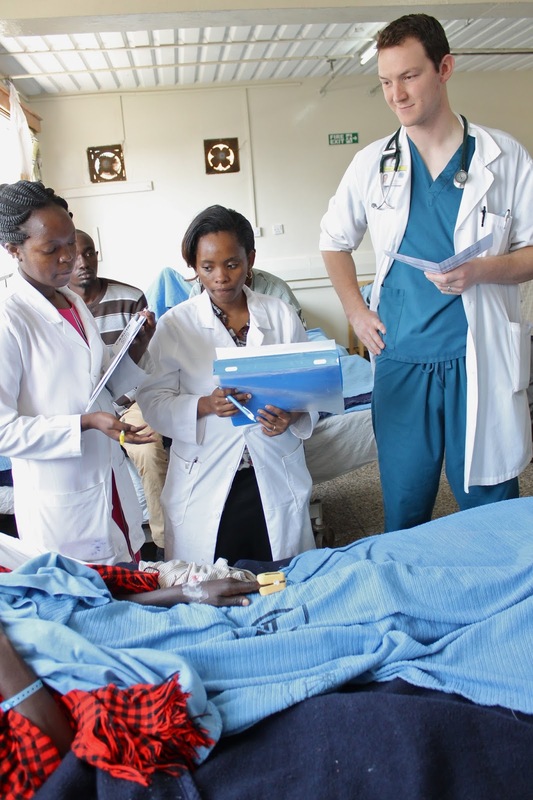 Most patients at Tenwek speak one of three languages, to varying degrees: English, Swahili, or Kipsigis. For those who speak English, no problem. Many people feel more comfortable using Swahili than English. I can ask a few simple questions, but otherwise our interns or nurses are essential for translating. There are still many patients who only speak Kipsigis, especially our older generations. The interns who speak Kipsigis are very valuable since many of our doctors come from different tribes. 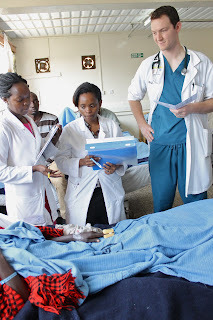 We also have Maasai patients and there are even fewer people in the staff who speak Maasai. The Maasai people are less likely to speak either English or Swahili, so anyone who can communicate clearly with them is highly valuable for translating. 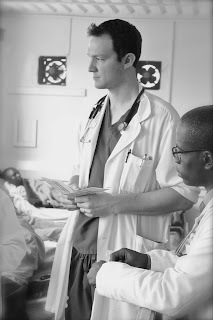 Often, we find ourselves reliant on other patients in the adjacent beds to help translate. This is possible because there is a vastly different cultural understanding of patient confidentiality here than in America, so someone in the bed next to your patient often becomes a translating asset! Give an example of a cross-cultural experience at the hospital. One morning we were rounding in the OB ward and came to the bed of a mother who had a C-section. She was doing well enough to be out of bed and thus was not there when we came. Even though the mother was not there, the newborn baby was. I looked around at the doctor team and asked, "Is there someone watching this baby?" My Kenyan colleagues laughed and asked, "Where do you think it's going to go? It was just born yesterday!" Then I looked at a Western colleague who was with me and we laughed as I explained that in the U.S. there is heavy security for newborn babies at hospitals to ensure that no one who's not the correct parent walks off with a baby. Our Kenyan colleagues were very surprised and said that no one here would be looking for extra babies! Tell us a patient success story. A young Muslim man in secondary school [i.e. high school] came to Tenwek and was diagnosed with Guillain-Barré Syndrome. This is a condition in which patients develops paralysis starting in their feet and going up their entire bodies. The most severe cases even paralyze their ability to breathe. This particular young man was in our ICU for over three months, and in the hospital for even longer after that. Despite many complications, he survived. He eventually left the hospital in a wheelchair but alive and on the road to recovery. While he was a patient at Tenwek, that young man accepted Christ. The hospital staff also had the chance to witness to his parents during his time here. We praise God for yet again revealing Himself through even the most tragic of situations. Are you looking forward to taking a break from the hospital with your upcoming HMA (Home Ministry Assignment)? It will be nice to have a break from being on the wards. There are so many tragic situations and it will be nice to step back and decompress from all of that from the past two years. What will you miss the most about working in Kenya while you're gone on HMA? Working with the residents has been a true joy that has allowed me to develop meaningful relationships over the past two years. It will be difficult knowing they're continuing their education without me there. Our most senior resident is one of my thesis advisees and he will be finishing his research and defending his thesis while I'm gone. 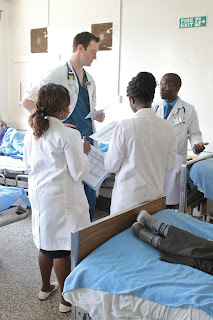 Three others will complete their summative exams and will move into Part Two of the program, which includes planning their Master's research/theses and starting to work alongside the consultants in running the wards and outpatient clinics. This is a fun time of collegiality. It will be hard knowing that all of these people that I've worked closely with and helped to meet their educational goals will need to look to other people this year for help while I'm gone.